The Electoral Distribution Commissioners have proposed significant changes to Western Australia’s electoral boundaries. In framing proposals the Commissioners have observed the statutory requirement that elector numbers in all districts fall within a permitted range (+/- 10% of the average district enrolment or -20% in geographically large districts) and been guided by the principle of ‘one vote one value’ set down in the Electoral Act. The Commissioners have also sought to achieve the best possible balance between the factors listed in section 16I of the Electoral Act. Since the 2013 election there has been a relative decline in the variation from average district enrolment of country regions overall compared with that in the metropolitan regions. The relevant figure for country districts is -5.23% compared with +5.39% in metropolitan districts. After considering all relevant matters the Commissioners have proposed a reduction by one in the number of country districts (with an expansion of the Mining and Pastoral Region district of Kalgoorlie to include much of the existing district of Eyre) and an increase by one in the number of metropolitan districts (the new district to be in South Metropolitan). The decision to include the additional district in the South Metropolitan Region reflects the high level of growth in that area, notably around Baldivis. The Commissioners are also of the view that adding a district to South Metropolitan, as opposed to one of the other metropolitan districts, enables the clearest delineation of boundaries across the entire metropolitan area. There will be consequent and other changes to the boundaries of all regions and 51 of the 59 districts. The Commissioners also propose that the names of 12 of the districts be changed. In most instances, the suggested new name is that of a prominent deceased Western Australian rather than that of a suburb or locality situated in the district. 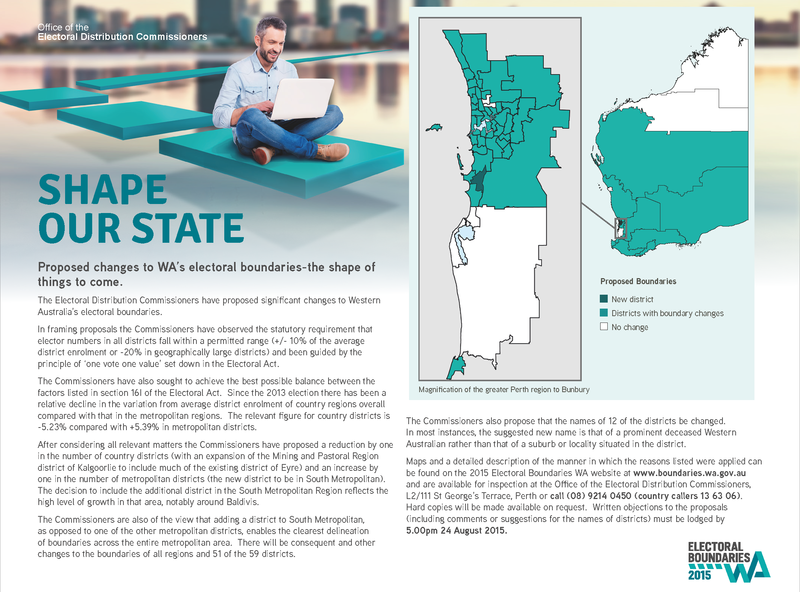 Maps and a detailed description of the manner in which the reasons listed were applied can be found on the 2015 Electoral Boundaries WA website and are available for inspection at the Office for the Electoral Distribution Commissioners, L2/111 St Georges Terrace, Perth or call (08) 9214 0450 (country callers 13 63 06). Hard copies will be made available on request. Written objections to the proposals (including comments or suggestions for the names of districts) must be lodged before 5.00pm, 24 August 2015. For more details, read the complete 2015 Proposed Boundaries and Reasons by district and region report.